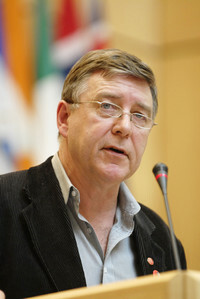 Ron Oswald was elected General Secretary of the International Union of Food, Agricultural, Hotel, Restaurant, Catering, Tobacco and Allied Workers' Associations - IUF - in April 1997. He has been a union member since 1969, when he first worked as a baggage handler at London's Heathrow Airport. Oswald obtained a BA in Economics and a MA in Labour Economics from the Universities of Warwick and Leeds. Prior to joining the IUF, he was a member and a shop steward/local union representative between 1973 and 1987. His international union experience prior to joining the IUF in 1987 included work with unions in the Caribbean, El Salvador, and West Africa.